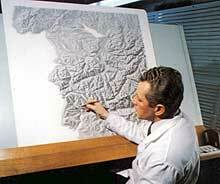 Cartographer Karl Mayek at work, “Schweiz”, scale 1:350,000. © Orell Füssli Kartographie AG. 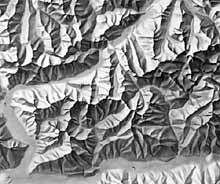 Originally, a simple pencil was the only tool needed to draw shaded relief. Although pencils do not yield pure black tones, using supplementary black ink can sufficiently darken the shadows on the highest mountain peaks. The opposite end of the tonal scale exhibits a similar problem. Pure white is not achievable with pencil because even the brightest papers contain pallid tones. As a solution, adding supplementary dabs of white paint emphasizes the brightest illuminated slopes. Unfinished shaded relief drawn with a pencil. The very high expense in terms of time and money of manual drawing excludes it from widespread use today. 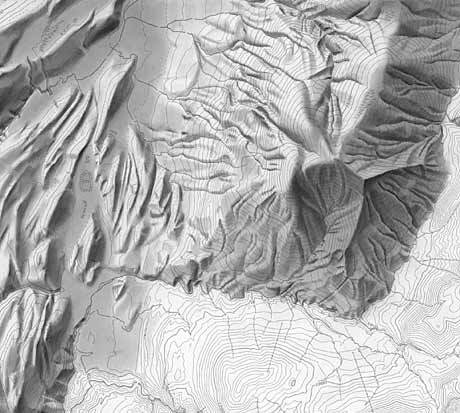 A better and faster method to obtain high quality shaded relief is by combining analytical shading with enhancements made in Photoshop.